Peel, core and chop one of the apples. In a pitcher, combine the Chardonnay, New Deal Ginger Liqueur, brandy and honey. Add the quartered orange, lemon, lime, cinnamon sticks, chopped apple, ginger and cloves and refrigerate overnight. Strain the sangria into a pitcher. Peel, core and chop the remaining apple. Peel, section and chop the remaining orange. Mix the apple and orange in a bowl. On a small plate, blend the sugar and cinnamon. Moisten the rims of wine glasses with water (or simple syrup) and dip in the cinnamon sugar to coat. Fill the glasses with ice. Pour in the sangria until three-quarters full. Top with a splash of club soda. 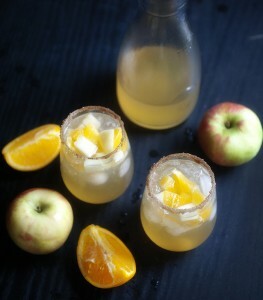 Garnish with a spoonful of the chopped apple and orange. Recipe adapted from Pretty Plain Jane’s Fall Sangria.